Prague is one of Europe's most atmospheric Christmas cities, as Donal Corkery’s winter wonderland footage shows. From soaring trees to cosy stalls, tasty treats to souvenirs and trinkets, nothing says Christmas like a continental market. And Prague's are some of the very best. Old Town Square and Wenceslas Square are the main events, but there are others too - at Republic Square, Kampa Island and St George’s Basilica. The joy is moseying between them. One of the best things about a Czech Christmas market break is the food, glorious food. Think spiralling potato chips, potatoes fried in cheese and garlic, or Trdelnik - a sweet pastry wrapped around a skewer and sprinkled with cinnamon sugar. And there will be pork. Lots of pork (don’t plan on losing weight here). Traditions run deep too – that’s one of the things that makes the city feel so special at this time of year. These aren’t makey-uppy markets parachuted into place for the season... they feel like they’ve been there forever. Take the Christmas tree in Old Town Square. It's shipped in from mountains north of the city and lit up like some kind of spaceship right at the heart of the market. Even the souvenirs - the clocks, decorations, amber jewellery, wooden toys and more - hark back to centuries of Czech tradition. It’s gimmicky, but in a good way. Throw in a backdrop of Gothic streetscapes, Prague castle and Charles Bridge - lit up like Christmas markets themselves - and you'll see why we're all aglow. It’s enough to make you break out in song. Donal travelled as a guest of Jurys Inn Prague (jurysinnprague.com). Centrally located near to handy metro and tram stops, the hotel offers decent rooms at decent prices (from €55 per room over Christmas), free wi-fi and a nifty bar and bistro-style restaurant for bookending your adventures. We found it a great base for a city break at winter – or any time of year. For those looking for retail therapy, the Palladium Shopping Centre (palladiumpraha.cz/en) is a short walk from the hotel; while those looking to explore local produce might stroll over to the Havelske Triste open market nearby. Aer Lingus (aerlingus.com) and Ryanair (ryanair.com) fly from Dublin. 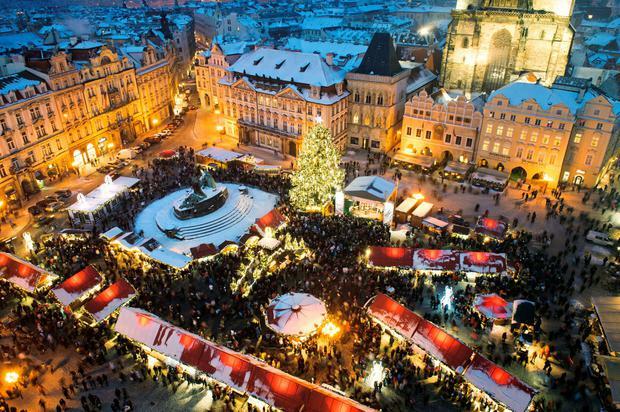 Dates: Prague's Christmas markets run to January 6, 2016.